Tomato Plants: How Long From Flower to Tomato? Are Tomato Plant Leaves Poisonous? Are Tomato Plant Leaves Edible? Tomato plants come in two types. Determinate varieties only reach about 4 feet tall, then they stop growing upward. Indeterminate varieties continue to gain in height throughout summer and into fall, reaching heights of 6 feet or more. When trellising or staking indeterminate tomatoes, this height can be an issue, as they overgrow their supports. This can also lead to breakage and damage to the stem as the plants become top-heavy. Topping the plants encourages more lateral branching and helps prevent the plants from growing too tall. Remove the suckers on the tomato plant so it only produces one to two main stems. Pinch off the shoots that form between where the leaf joins the main stem. This prevents them from growing into multiple main vines and makes the tomato easier to tie to a stake or trellis. Prune off the top of the main vine when it reaches the desired height for the plant. Use clean, sharp pruning shears to make the cut so the plant isn't damaged. Pinch off the any new suckers that form where you topped the plant, as these can become new stems. Pinch them off where they form between the junction of the leaf and the topped stem or where lateral stems join the main stems. Pour either the liquid soap or the canola oil in a small bucket. Add the water to the bucket and stir the two ingredients. Fill a spray bottle with your homemade insect killer. Spray the insects on your tomato plants first thing in the morning. Insects are more sluggish early in the morning. Repeat each morning until you no longer spot insects on the tomato plant leaves. Purchase mosquito-repelling plants. Marigolds add bright color to the garden. Basil and garlic both add depth of flavor to developing tomatoes. Choose one that suits the needs of your household. Dig a ring around your tomato plant, approximately 4 to 6 inches further out than the furthest-reaching branch of the tomato plant. Break up the soil in the ring to approximately 4 inches deep. Plant the mosquito-repelling seedlings into the ring. Space them as close together as possible, to create a strong repellent barrier. Brush the soil back over the plants' root balls and into remaining spaces in the ring. Water thoroughly, to enable the root systems to settle and release any trapped oxygen bubbles. Thereafter, water as you would regularly water your tomato plants. The period from planting to harvesting tomatoes depends on the variety grown, as it can take anywhere from 55 to 75 days. 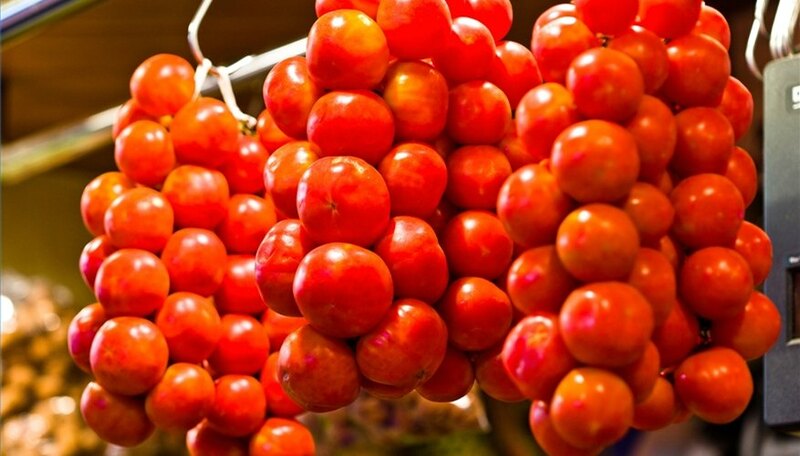 After tomato flowers develop, bloom, are fertilized and set fruit, it takes approximately 45 to 50 days before the fruit is ripe for harvesting, according to the University of Arizona. Add a garden fertilizer to the soil prior to planting the tomatoes. Choose a low nitrogen and high phosphorus type such as 8-32-16. 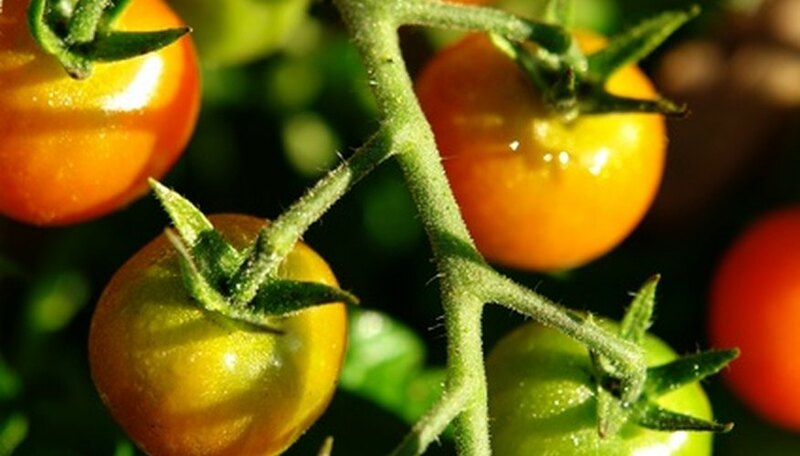 Plant tomatoes once the soil temperature has reach 60 degrees F. Planting too early or late will cause a delay in blooming and fruit production. Apply a soluble fertilizer such as 15-30-15 after planting by mixing 2 tbsp. per gallon of water. Place tomato plants 24 inches apart to prevent disease by increasing air circulation around the plants. Prune the side shoots on late season tomato varieties to focus the plants energy on blossom and fruit production instead of creating bushy growth. Water tomato plants regularly at a rate of 2 quarts water per plant per day. Soak the soil well as this will encourage deep root growth. Place mulch around the plants to prevent weed growth and assist with water retention. Apply a 5-10-5 fertilizer through the growing season if soil tests indicate low fertility. Work the fertilizer into the soil down to 6 inches. Pound the stakes into the ground at intervals around your tomato plants. If you are only protecting one or two plants, you only need one or two stakes. If you are protecting a large tomato patch, place stakes 4 feet apart around the perimeter and place additional stakes in the center area (also 4 to 5 feet apart). Use the hammer to pound the stakes approximately 4 to 6 inches into the ground. Stretch the plastic tarp over the tomato plants, with the stakes holding the tarp up and off the plants. The plastic must not touch the tomato plants, because foliage that touches the plastic will freeze. Create a pocket of warm air above the tomato plants by suspending the plastic above the plants. Extend the tarp down to the ground around the tomato plants and secure it with bricks or large rocks. Remove the plastic tarp the next morning when the temperature rises above 40 degrees F.
Place mulch on the top of the soil. This helps to reduce evaporation and to keep the water where the tomato plants need it most: the roots. Water your plants every one to three days. This is usually sufficient even during the hottest parts of summer. If you are unsure whether your plants need more water, stick your finger into the soil around the base of the plants to a depth of about an inch. If the top inch of soil is dry, it's time to water. If the top of the soil is still wet or damp, do not water. Water the roots of the plants and not the leaves, which can encourage foliar diseases and soil-borne ones as well. Add water to your tomato plants slowly. One way to do this effectively is to use a drip hose, which adds water in a trickle. Fill a 5-gallon bucket with water. Add 1 cup of alfalfa meal to the water. Blend it well. Let the mixture sit for about a week to make an alfalfa meal tea. Pour one 5-gallon bucket of alfalfa meal tea evenly over each acre of garden area to get the nutrients deep into the soil before transplanting or planting tomato plants. Add a side dressing of dry alfalfa meal to each of the tomato plants six weeks after the initial application of the tea. Measure ½ cup of alfalfa meal for each plant and apply to the soil. Water the soil until it is moist immediately after applying the alfalfa meal. Repeat the application of dry alfalfa meal every six weeks during the tomato plant's growth. The stems and leaves of the tomato plant are poisonous. However, they are only toxic if consumed in large quantities. The only edible parts of the tomato plant are the unripe or ripened tomatoes. The toxic principles in tomato plants are demissine and solanine, also known as glycoalkcoloids. Examine each of the tomato plants. Locate the thickest and greenest branches coming out of the main tomato stem. Select three to five of these branches to be the growing branches. Remove all the other branches completely from each of the tomato plants. Remove any large leaves off of the remaining stems. Leave only the smaller leaves. However, don’t remove the leaves at the end of the branches. Don’t remove any leaf clusters that are currently filled with blooms. Remove any dead leaves, dead stems or yellowing branches as the tomato plants grow. 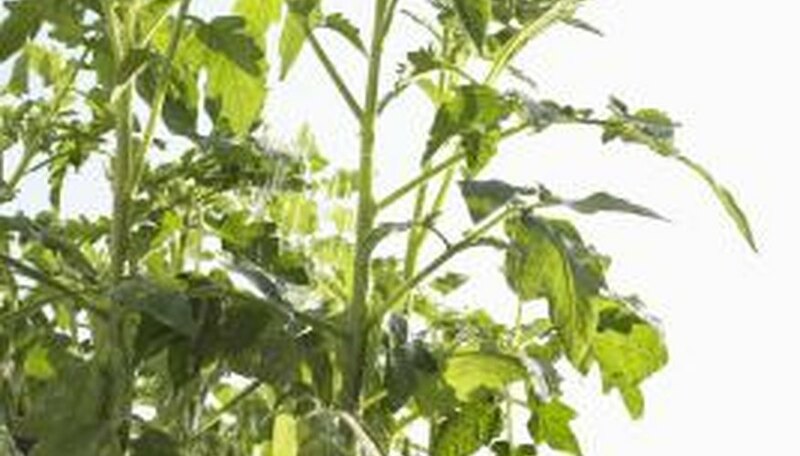 Save the tomato plant’s energy to grow new blooms, instead of repairing yellow areas. Mix 10-10-10 liquid fertilizer according to the manufacturer’s instructions. Mix in the appropriate amount of fertilizer to organic compost. Put the mixture at the bottom of each tomato plant 2 inches deep. Put a 1 inch layer of mulch on top of the organic compost mixture (from step 4). Water tomato plants twice weekly but don’t leave the ground soggy or get the leaves wet. Purchase an empty 5-gallon bucket with a snap-on lid. This bucket can be found at hardware stores. Clean the bucket with warm sudsy water to prepare it for planting your tomato plant. Cut a hole in the bucket using a drill or a utility knife. The hole should be right in the middle of the bottom of the bucket and about 2 to 3 inches in diameter. Cut several 1/2-inch holes in the snap-on lid of the bucket to allow you to water your plant. Place several layers of newspaper in the bottom of the bucket, covering the hole. This will later be used to anchor the tomato plant. Fill the bucket with a 40-lb. bag of soil and put on the lid. Soils with vitamin additives, like Miracle-Gro, are the best for growing tomatoes. Turn the bucket over, and plant the tomato seedling. Cut two slits in the newspaper at the bottom of the bucket to allow you to plant the tomato plant. Plant the seedling with only about 3 inches of the plant coming out of the hole. Use extra soil to anchor it in the bucket. Hang the bucket in a sunny area and water. Tomatoes require at least 50 percent sunlight. Move the bucket according to where the most direct sun is during the day. Harvest tomatoes as they ripen on the vine. Tomatoes will begin to form not long after the tomato plant flowers. The fruit should be red and firm before cutting from the plant. Cut at least 6 inches from the tip of an existing tomato plant, making sure there are two or more sets of leaves on the cutting. Fill each container with moist potting soil, and press a pencil down into the center to create a hole. Snip off any flowers or buds from your tomato clippings, then snip off the bottom leaves. Leave the top two leaves intact. For each new plant, place the tomato cutting in the hole you made in the potting soil. Make sure the section you just trimmed the leaves from is below the soil surface. Push the soil up around the tomato cutting stem to secure it in place, then put the container in a warm place out of direct sunlight. Keep the soil moist, and in about a week start gradually exposing the cuttings to more light until they are in full sunlight for the better part of the day. Once the cuttings are used to the full sunlight, transplant them into larger containers or put them out into the garden. While the fruit of the tomato is edible, the plant's leaves and stems are not. Symptoms of tomato plant poisoning include headache, dilated pupils, stomach pain, diarrhea, vomiting, respiratory and circulatory depression. The hundreds of varieties of tomato seeds available range from an heirloom to the small, sweet, cherry type. 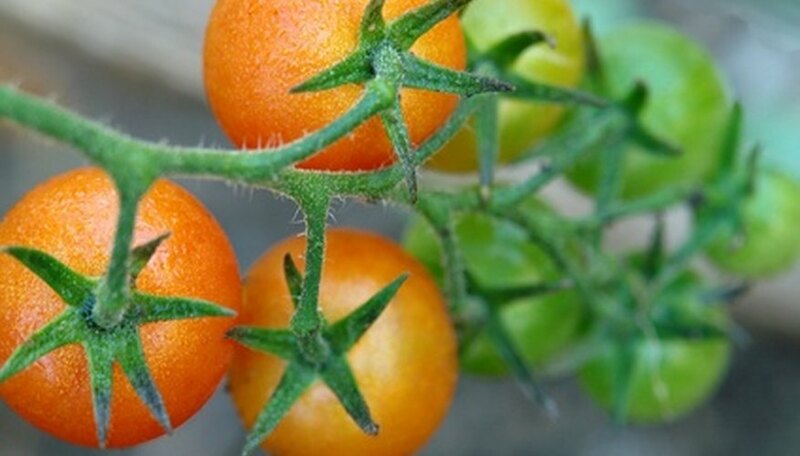 Hybrid tomato seeds produce better fruit and resist diseases common to the plant. The Big Beef variety is disease-resistant, and the Jet Star is lower in acid than most varieties. Tomato seeds do not require sunlight until they have sprouted. Plant seeds in shallow trays in sterile potting soil, not common garden soil. To save tomato seeds from the fruit, you must following a fermentation process. Tomato seeds can grow successfully in commercial flats or simple plastic or plastic-foam cups with holes poked in the bottom. Tomato seeds are widely available at garden centers and nurseries or through mail-order catalogs. Tomato seeds should be started indoors about six to eight weeks before you plant them outdoors. Lay down a thick layer of mulch around the tomato plants as soon as they are in the ground and watered in. The mulch will help preserve moisture to the plants and cut down on insect problems. 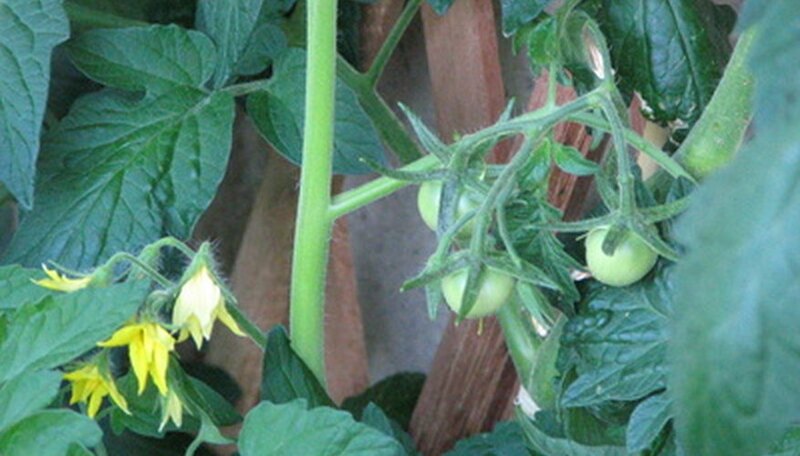 Spray the tomato plants weekly with a solution of liquid seaweed. Follow the instructions on the seaweed label as far as water/seaweed ratio is concerned. Side dress the plants with mature compost when the organic tomatoes begin flowering. Spray the area around the plants with a manure tea when the fruit first begin to appear. Do not spray directly on the leaves or fruit of the tomatoes. Water tomato plants in the early morning, before the sun has reached its midday height. This will give the moist soil time to warm up before the temperatures drop in the evening, making sure the plants aren't sitting in sopping dirt overnight. Apply the water to the base of the plant with a watering can or hose, being careful not to wet down the leaves and fruit as this can damage the tomatoes. Make sure all water is absorbed into the soil. Tomato plants do need to be watered thoroughly, but take your time to ensure that the water isn't puddling on top of the dirt. If this happens, the plant has been over-watered. Keep the tomatoes on a schedule. Water them every day at the same time if you live in a very hot area, or every other day if the heat doesn't cause the soil to dry out within 24 hours. Plant potted tomatoes in pots with large, well-spaced drainage holes in the bottom. The holes will allow the excess water to flow out of the bottom of the pot. If the water is trapped in the pot, it can rot the plant. Drill a 2-inch hole in the center of the bottom of a clean bucket. Place the bucket between two sturdy surfaces, such as a pair of wooden workhorses, for stability to access the hole. Thread a tomato seedling through the hole by pushing the root ball through the hole to the inside. Roots are much hardier than tender leaves and branches--damaged roots can heal while damage to a new plant can be fatal. Use sphagnum moss or a piece of landscaping fabric to hold the tomato plant in place. Have a helper hold the plant in place. The moss or fabric is needed not only to help anchor the plant but to keep loose soil from falling out. Amend your potting soil by adding compost and mixing well. Tomatoes grow best in soil that is high in phosphorus and potassium, and lower in nitrogen. Using a blend of soil specially designed for tomatoes is helpful. Fill bucket with potting soil, keeping 2 inches of clearance at the top. Have your helper hold the plant to keep it from slipping out. Hang bucket in sunny location. Water the tomato seedling or juvenile plant twice daily, once in the morning and once in the evening. Apply 32 ounces of water per plant at each watering. Add organic or synthetic mulch around the base of the plant once the tomato seedling is 3 inches tall. Mulch helps to guard soil moisture against wind evaporation and the sun's heat. Increase the daily watering as soon as the tomato plant produces flowers and begins growing fruit. Apply 64 ounces of water per plant twice a day. Fertilize the tomato plant every three weeks as soon as the plant's fruits measure 1 to 2 inches in circumference. Use a standard granular garden fertilizer, applied according to the label's guidelines as potency varies widely by brand, or straight nitrogen--ammonium nitrate intended for garden use and available at most nurseries--at the rate of 1 pound per tomato plant. Apply before a standard watering session to help deliver the nutrients to the tomato plant's roots. Better Boy tomatoes are indeterminate and mature in 72 days after planting. Better Boy is considered a red tomato and has globe-shaped red fruit. Average fruit size of the Better Boy is 12 oz. Indeterminate tomato plants such as the Better Boy are tall vine plants that will bear fruit until the first frost. Better Boy plants need to be staked up with a trellis or tomato cage to keep the fruit off the ground. Better Boy is resistant to verticillium wilt, fusarium wilt and nematodes. 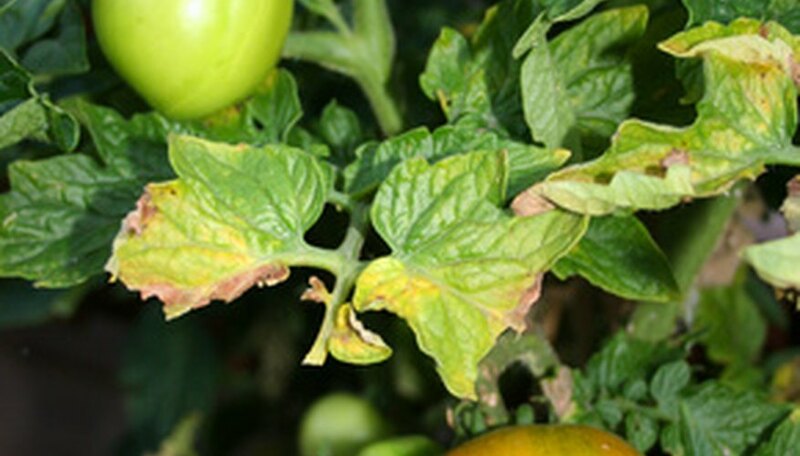 Fusarium and verticillium wilt are diseases that will cause leaves to turn yellow and will hasten premature dying in tomato plants. Lift up the leaves of your tomato plants and look for tiny caterpillar eggs. You can remove these eggs by hand and burn them. This is an easy way to destroy the caterpillar before it has a chance to destroy your tomato plant. Set a few bird houses near your crop of tomatoes. Birds are natural predators to the caterpillar and will kill and eat any caterpillars they see. Plant sweet alyssum, fennel, dill, or spearmint next to your tomato plants. Tiny parasitic wasps that are attracted to these plants will see the caterpillars and lay their eggs on them. When the eggs hatch, the larvae eat right through the caterpillar and kill it. Make your own insecticidal spray. Fill a spray bottle with a water and add dish soap. Mix the ingredients together and spray your tomato plants with it. This solution will not hurt your tomato plants at all. It will, however, kill the horned worm caterpillar. Whiteflies cause damage to tomato plants by feeding on the leaves. Control whiteflies biologically by introducing known whitefly predators such as predaceous wasps, ladybird beetles and lacewings to the garden or greenhouse. Insecticidal soaps, used according to manufacturers instructions, reduce the population of whiteflies on tomato plants. Pound the stakes into the soil approximately every 3 feet along your rows of tomatoes. If you already have support stakes or cages surrounding your tomato plants, omit the stakes. Spread the old sheets over the tomato plants with the stakes or tomato cages supporting the sheets and keeping the sheets from contacting the foliage of the tomato plants. Place the sheets over the tomato plants in the late afternoon when you expect frost during the upcoming night. Anchor the sheets around the tomato plants with the large rocks. Leave the sheets over the tomatoes until the following morning. Wait until the temperature rebounds back over 40 Fahrenheit and remove the sheets. Cut a piece of wire fencing that is 3 to 6 feet tall and 9 1/2 to 12 1/2 feet wide with wire cutters. 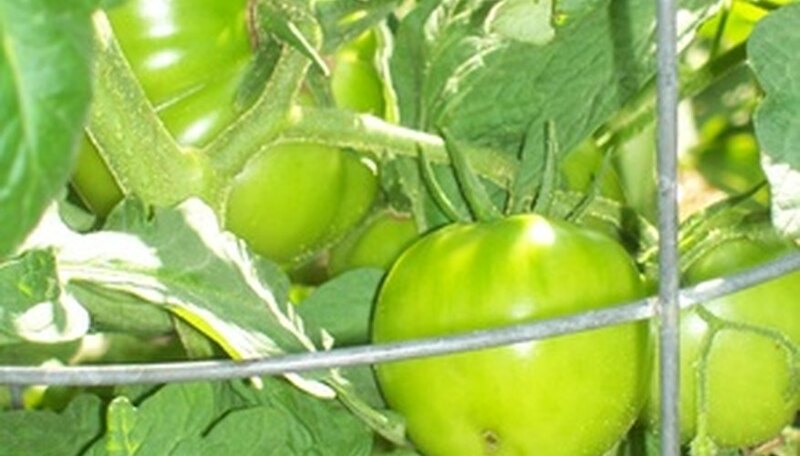 The size of the wire depends on the mature size of the tomato plant. Taller plants need the larger size. Use galvanized wire with space of least 6 inches so your hands can fit inside the cages. Bend the fencing so the width forms the diameter of a circle. The circle is 3 to 4 feet across to make reaching the fruit less of a stretch. Connect the sides of the cylinder with plastic fence ties. Space the ties out to every 6 inches along the seam. Pull the ties down tight with a pair of pliers. Place the tomato cage around the tomato seedling when it is first planted to avoid damaging the branches later. Lay the branches on the wires of the tomato cage as the plant grows. Do this early in a branch’s growth while it is still bendable to avoid breakage. Purchase tomato plants with a capital “F” after the name of the tomato variety. These tomato varieties can still get tomato wilt, but it won't kill the plant and the plant will still produce tomatoes. Rotate your tomato growing area each year. Wait four years until you plant tomatoes in the same spot. Remove tomato plants completely in the fall when you are preparing your garden for winter. Remove all plant refuse over the winter. Do not use it as compost. Instead, discard it all. This will prevent spores and fungus from infecting the soil. Plant the seeds or start transplants early indoors before to the last frost. Once the danger of frost has passed, the plants can be moved outside in containers or set directly in the ground. Place Goliath tomato plants 3 feet apart. Each hole should be 12 inches deep unless the transplants and seedlings are tiny. Plant tiny plants or seedlings at the same depth as their container. Work organic matter into the garden soil around the tomato. Use peat moss, leaf debris or aged manure. Mix at a ratio of 50 percent organic matter with 50 percent garden soil. Fertilize each plant with 1/2 cup of 5-10-10 fertilizer per plant. Water the fertilizer in thoroughly. Apply 2 to 3 inches of mulch such as peat moss or bark chips around the base of the Goliath tomato plant. The mulch will help reduce weed growth and keep the soil moist. Harvest Goliath tomatoes when they appear completely red. Squeeze the tomato to check its firmness. The Goliath tomato should feel hard and firm to the touch before harvest.